Mikhail Atom is a Russian electronic musician who uses philosophy (albeit, a somewhat wishy-washy, new age philosophy) as the underpinnings for his ambient, instrumental voyages. This CD, which was originally a cassette release, seems to have been released by APN records, as a 6 track disc, though the version I have is a CD-R released by Audiofile Round Tapes, and contains only 4 tracks. If my information from the APN web site is correct, the Audiofile Round Tapes version is missing two shorter tracks, both in the 3-4 minute range. Why? I have no idea. Anyway, on to the music. As instrumental electronic music goes, it's not bad. The first 3-tracks (there are no titles listed in the Audiofile Round Tapes release, though the APN website refers to each track as AstroEpos Part 1, AstroEpos Part 2, etc.) are quite intense, with harsh crashes of sound against a shimmering, spacious backdrop; definitely stuff from outer space, and nicely done. The final track, a 25-minute long ambient epic, is far more earthbound. Soothing ambient washes of sound meander around earthly sounds such as rain, waves, and laughing children. Herein lies my main complaint with the album. These are the kinds of sound effects that have been used countless times on countless ambient and new age recordings over the years. Had this album come out 15 to 20 years ago, I might have called it innovative. Today, it seems like Atom is treading over the same ground (or flying through the same space) as many electronic musicians before him. A pleasant enough listen, but nothing to get to overly excited about. 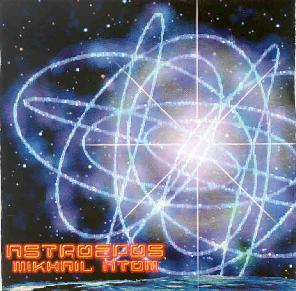 For more information you can visit the Mikhail Atom web site at: http://atom.nigilist.ru. Sursumcorda Records web site: http://www.sursumcorda.com/. Mikhail Atom can be reached directly by e-mail at: m1atom@yandex.ru.